In latest gesture for normalization, Socialist regime whitewashed despite still providing 'safe haven' for terrorists, including Americans. US President Barack Obama will remove Cuba from the list of state sponsors of terrorism according to a White House announcement on Tuesday, as he continues to push for normalization with the Socialist regime. Cuba had been on the list with Iran, Sudan and Syria. Back in December when Obama and Cuban President Raul Castro announced a renewal of diplomatic ties after 50 years of hostility, Obama expressed his desire to remove Cuba from the terror sponsor list. Following a State Department review that he initiated, it was decided to remove the country from the list. Obama told Congress that Cuba "has not provided any support for international terrorism" over the last six months, and that Cuba "has provided assurances that it will not support acts of international terrorism in the future." The announcement comes after Obama met with Castro over the weekend, a move that caused Former Florida Governor Jeb Bush to wonder why Obama met Castro but snubbed Prime Minister Binyamin Netanyahu last month when he was in Congress. Cuba's designation as a state sponsor of terror was decided in 1982, with the White House noting its efforts "to promote armed revolution by organizations that used terrorism." The latest State Department report on the topic in 2013 stated that Cuba was still on the list because it is providing "safe haven" for Basque separatists and Colombian rebels. The Socialist regime likewise houses fugitives wanted by the US, including Joanne D. Chesimard, who is wanted for murdering a New Jersey state trooper and now preaches terrorism and revolution to overthrow America. Senator Robert Menendez (D-NJ) last week called the move "another significant misstep in a misguided policy." 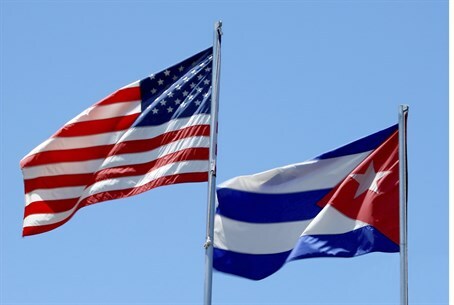 But White House press secretary Josh Earnest claimed that America remains concerned about Cuba's actions, adding "our concerns over a wide range of Cuba's policies and actions fall outside the criteria that is relevant to whether to rescind Cuba's designation as a state sponsor of terrorism."